You see, once upon a time I had been rather unkind to (read: trashed) the first restaurant opened by the same group. It was one of the few times when I felt a restaurant had few, if any, redeeming qualities, and I didn't care if I ever went back... so I kinda just let it rip in my blog post. Within 24 hours of putting up my post, one of the guys responsible for the group sent me hate mail via two different channels. He was obviously not very pleased that I, who had eaten his food for free at his invitation, actually dared to say anything negative in return. I arrived at the appointed time, but none of my friends were in sight. I tried pinging them and calling them, but no one picked up. After going down to the dining area in the basement, I realized that it was near impossible to get any cell reception down there. Not the greatest situation in this day and age, but maybe it ain't so bad from a different angle. Wagyu steak tartare, Yunnan style, hot and sour, herbs - not bad at all, with deep-fried and marinated shallots, and Thai basil. A little spicy, and a little acidic. Served on deep-fried krupuk made from cassava. Fried chicken mid wings with shrimp sambal - these were OK, and the sambal wasn't too spicy. Mom's "mostly cabbage, a little bit of pork" dumplings, sacha soy dressing - this wasn't an accurate description, because we were all surprised by the big clumps of pork inside and how little cabbage there was. The wrappers were pretty thin and more akin to Japanese gyoza (餃子) wrappers instead of the traditional Beijing-style dumplings. I liked the spicy soy with chopped chilis, but I don't remember tasting any sacha sauce (沙茶醬). Fried cauliflower, Brussels sprouts, maple bacon chili jam - mmmm smoky bacon... spicy sauce with fermented soy beans (豆瓣醬). Then came a trio of classic Cantonese roast meats: the Worm Supplier had forgotten to specify our wish for fatty pork, so the Kurobuta pork char-siu was slightly on the lean side... although it was still tender and the grill marks were obvious. The soy chicken was OK and came with the traditional minced ginger and spring onion dip on the side. The real winner was the roast goose, as the skin was delightfully crispy, sheltering chunks of fat that oozed and coated the succulent meat with flavor. Grilled calamari, leek, Chinese celery, five-flavor sauce - the calamari was very lightly grilled, and came with a nice melange of Thai basil, Chinese celery, chili and deep-fried shallots. DIY pork san choi bao, cucumber kimchi, chili bean paste, garlic stems mixed herbs - curious that they should add corn here, along with chopped chives and shredded Thai basil. I added a little cucumber kimchi but not the pickled purple cabbage. Not bad at all. Roast wagyu short ribs, jalapeno puree, green shallots kimchi, soy glaze - YUM! The beef had clearly been deep-fried to create a thin crust. We got to have three different textures here: the bits attached to the tendon obviously were cooked a little more and were more crusty. One end of the rib delivered slices which were more marbled with more even distribution of fat, which was very nice. Then there was the opposite end, with obvious chunks of fat. Slurp. I was happy to have this on its own along with the scallions, but the jalapeño purée added a nice little twist to the dish, too. Prawn lo mein with shellfish oil, grilled shallot, crispy garlic - it was inevitable that we would compare this with Alvin's version, which I last tasted at MC Kitchen (I refuse to call it MIC Kitchen even though the assholes at McDonald's made him change the name). This was not bad, but a far cry from our preferred dish. The shellfish oil was also a little sour... perhaps to cut through the oil... but I like my fatty oil! 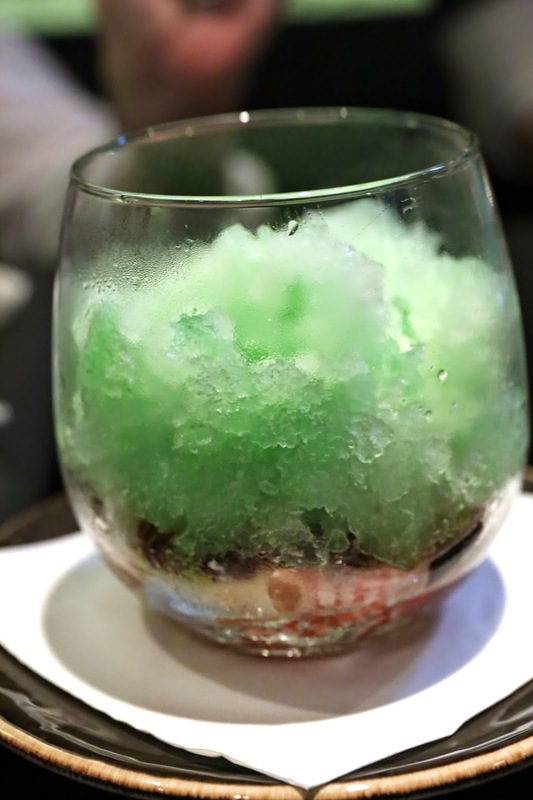 Granny Smith apple granita, Calpis sorbet, mochi, koji jelly - this was probably my favorite of the three, but only because it tasted cool and refreshing. Matcha sponge cake, chocolate ganache, hazelnut praline, strawberries - not sure why they bothered with the sponge cake, because the chocolate simply overpowered everything... except the strawberries. And... we got fortune cookies at the end! I am still a little miffed that we didn't get them at Fu Lu Shou (福祿壽). This was a good amount of food and I don't think any of us left hungry. I thought the food was reasonably good - at least the savory dishes - and there were no obvious fails. Given the reasonable pricing, I can see how this place can become popular with plenty of satisfied customers - especially with the expat crowd. However, I do still have a few pet peeves. Like the other restaurant in the group which I had the misfortune of visiting, the place was just too damn dark. I saw diners at another table whip out their smartphones and turn on their camera torch just so they could read the menu. What's up with not wanting us to read the menu?! The music was also just too damn loud. I understand these guys wanna create a hip, happening joint with the vibe... but when you turn the volume above a certain level, your customers can no longer hear themselves think, much less carry on a conversation. Well, I had already tempted fate once tonight, and I shall count my blessings and thank my lucky stars that nothing happened... so I'm still staying the hell away from the other places! For another take on the same meal, here is the review on South China Morning Post's 48 Hours.